Mendoza City is located about 650 miles from Buenos Aires. 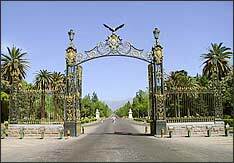 It is the capital of the Province of Mendoza, whose three major urban areas are Mendoza city with neighboring departamentos (Towns), San Rafael and Malargue. There are airports with commercials flight to these cities; however, Mendoza is the only one with international connections and Malargue is only opened during the winter to support the world-renowned Las Leñas Skiing Centre. It is only 220 miles from Santiago in Chile, with daily flight connections traversing the highest Andes peaks in 45 minutes. This region invites you to enjoy the whims of nature, to choose boundless adventure, and to celebrate the best of life. Mendoza is located in the region of Cuyo, which means “country of the deserts,” as the Huarpes native culture used to call it. But it’s more than that; it conveys high peaks, landscapes drawn by the wind, torrential mountains streams, excellent grapevines, snow, sun, and year-round blue skies. The Central Andes, sheltering the Aconcagua mountain, it is the best scenario for climbers worldwide who are willing to conquer the almost seven thousand meters which separate them from the top. Starting at Los Horcones lagoon, you will encounter snowstorms, huge ice needles, underground rivers, streams, glaciered and endless snow if your goal is getting to the summit. The province of Mendoza has also 3 skiing resorts; you just name it: alpine, extreme and Nordic, skiing, snowboard, big foot, snow polo, motorbikes and sledges. Mendoza offers you these and many other possibilities for enjoying the snow. Vallecitos, Los Penitentes and Las Leñas — internationally best-known for both the quality of its ski slopes and runs, and for the state-of-the-art equipment with luxurious Five-Star accommodations and excellent hospitality. 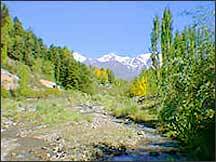 San Rafael, in the south of Mendoza, has its own profile. Its geography comprises the silence of the dunes of el Nihuil Desert and the rumbling of the mega discos. The bluish color of the Atuel River and the bright stainless steel of the tanks used to ferment the wine; all the adventure tourism proposals and the more peaceful attractions of golf, sports fishing and gourmet delicacies. But the name “Mendoza” acquired international fame due to the gourmet production of wine. The beauty of the vineyards, the possibility of visiting the wineries and tasting the best wines next to the barrels used to age them, make the circuit "the Route of the Wine” an unforgettable experience. 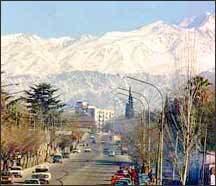 Mendoza is best known as the land of the sun, and it is the origin of the best export rd and white wines. Mendoza is a true oasis in the middle of the dessert like landscapes of Cacheuta, at about fifty kilometers away from the capital of the province of Mendoza, offering one of the best thermal baths of the region. In addition to their curative waters, the spas offer mud-therapy treatments, jacuzzi, sauna, hydro-massage and even a vaporware, i.e. an underground cave with steam baths. Of course, you can enjoy the pleasures of five-star hotels, including a casino. The Aconcagua State Park protects the natural treasures of the fauna and flora surrounding the highest peak in the continent, Mt. Aconcagua. This region will encourage you for a adventuring through horseback riding, rappel, trekking, rafting, hang gliding, biking, climbing hard-to-reach places, and discovering kite surfing, among others. It is also offers its lovers endless snow summits, inactive volcanoes, torrential rivers, millenary small lakes, reserves of guanacos (a lowland relative of the upper-Andean llama), and vicunas (a wild ruminant related to the guanaco but smaller, and yielding even softer wool), and the safe company of expert guides. The glaciers of the Andes Mountains supply the water, which irrigates the fruit orchards and vineyards where the famous Argentine wines are made. Head for a half-day sightseeing of Mendoza. The city founded in 1561 was totally destroyed by an earthquake in the late 1800’s centuries later. Throughout the tour we shall visit the modern city with its tree lined streets and its typical irrigation trenches. The historic district is a must with a brief stop at San Francisco Ruins, the oldest bricks of the city that survived the earthquake and only vestige of the colonial architecture. See the Independence Square, the financial district, the civic center, and the ruins of the church of San Francisco. Drive toward the city outskirts to see San Martin Park, located at the foothills of the Precordillera de loss Andes, where every year the Fiesta de la Vendimia initiates the harvesting season in Mendoza with a large and colorful parade that ends with the election of the National Queen of the Harvesting. Enjoy a panoramic view from De La Gloria Hill, next to the monument honoring General San Martin and his troops that crossed the Andes almost 200 years ago seeking Independence. ©2005–08 1stClassArgentina.com. All rights reserved.